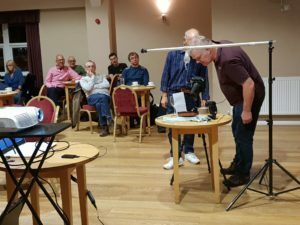 On Monday evening 15th October an eager audience of members at Brookhouse was treated to an evening of very practical demonstration and instruction by John Gardner. His subjects for the evening were a response to requests from members so they were very relevant. In the first half John concentrated on off-camera flash techniques using speedlights (the flashguns you can attach to your camera). John clearly showed why you need to get the flash off the camera, particularly for portraits. He explained how he uses manual mode for the flash and the camera, explained why and gave suggested settings for good results. John then moved on to the tricky problem of lighting with flash for close-up or macro photography. The problem here is that, if used on-camera, the flash will be illuminating an area beyond the actual subject and, if you are not careful, the off-camera flash will create shadows of the camera. In addition with close work you tend to lose a lot of light and also you require a high F stop for depth of field, thereby losing even more light, so you definitely need the flash. John demonstrated a bracket he has had for a long time which attached to the tripod bush on the camera and can support 2 flash guns. This allows the flash to be bright and very close to the subject, thereby eliminating the problems. To assist even lighting he showed a home-made small softbox (would you believe made out of a cereal carton, kitchen roll and sticky tape – very Blue Peter!) which he has used for many years, and relatively cheap Chinese radio flash triggers. It also demonstrated that you don’t have to spend a fortune on kit to get results. In the second half of the evening John concentrated on trying to capture water droplets. He created a very simple set-up with a small plastic bag suspended on a pole, over a dish with water in it. He used a pin to create a tiny hole in the bag so that drops of water came out and fell into the dish. Manual focusing was used so that he could pre-focus and know that when the shutter opened the shot would be in focus. Again manual settings were used and an off-camera flash. The flash was particularly important as you needed the briefest of exposures to freeze the droplet and its action on the water in the dish. You would need an exceptionally high shutter speed (say 1/5000th of a second) and there would not be enough light to give an image, but the flash duration may be as short as 1/8000th of a second so would freeze the action. Ideally he would have liked a large drip every half second or so but this proved rather difficult to achieve. However quite a few good shots were captured and it was all very entertaining. John showed that even a simple white envelope could make a good reflector. To finish with flourish John half-filled a wine glass (with water I add) and dropped a small tomato into it trying to capture the moment it entered into the water. Again, lots of fun was had with a wonderful image at the end of it. As John said, it takes little time and effort to set up and gives you something to do when there’s nothing on the TV! 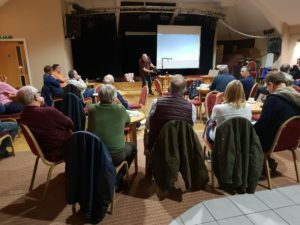 In all it was a fascinating evening giving a wealth of information which I am sure will be being tried out this week by many of the members (preferably in the kitchen with plenty of kitchen roll to mop up the water!). Special thanks should go to John for the way he clearly and patiently explained everything and brought the fun back into photography.